We continue to live up to our nickname here in the Treasure State. 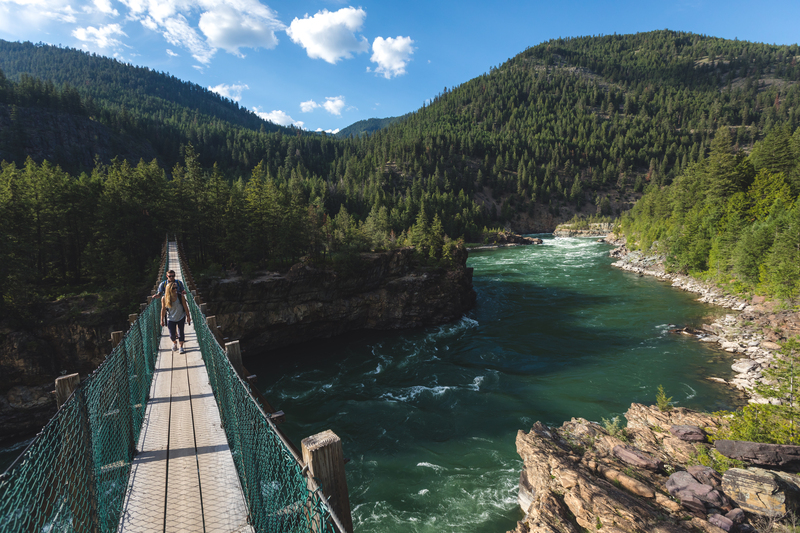 Montana is chock-full of hidden gems, and when it comes to adventure, Glacier Country is a treasure trove of discovery. One of our best-kept secrets is our handful of small-town ski hills, where fresh powder delivers and local vibes prevail. What you won’t find on these hills? Crowds, high-priced lift tickets and long lift lines. Here’s the inside scoop on where to find some of the country’s best undiscovered skiing and snowboarding. 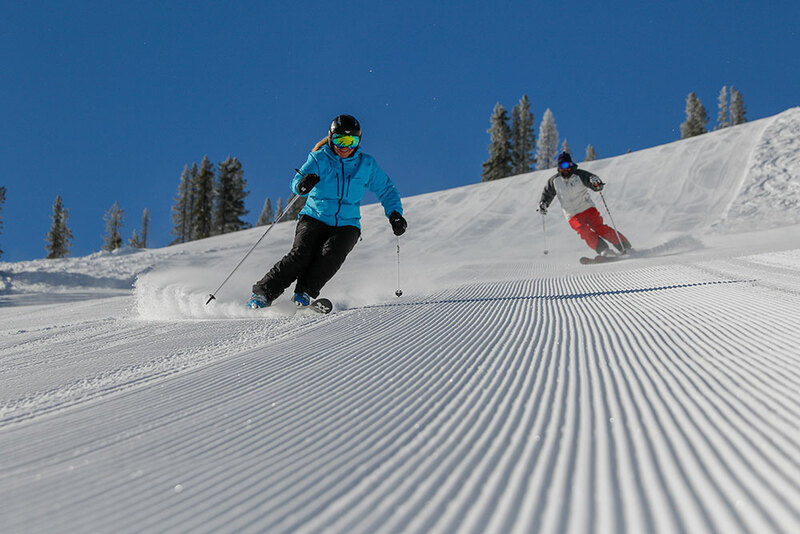 Discovery Ski Area is a true local’s hangout, offering beautiful views and the perfect combination of uncrowded slopes, tree skiing, expert bowl skiing, groomed trails and mogul runs. You’ll find some of the steepest lift-served terrain in the region here, while the variety of beginner and intermediate runs call to all abilities. Discovery—known locally as “Disco”—is a must-experience for anyone, and the lodge’s famous shortbread chocolate chip cookies alone are worth the visit. 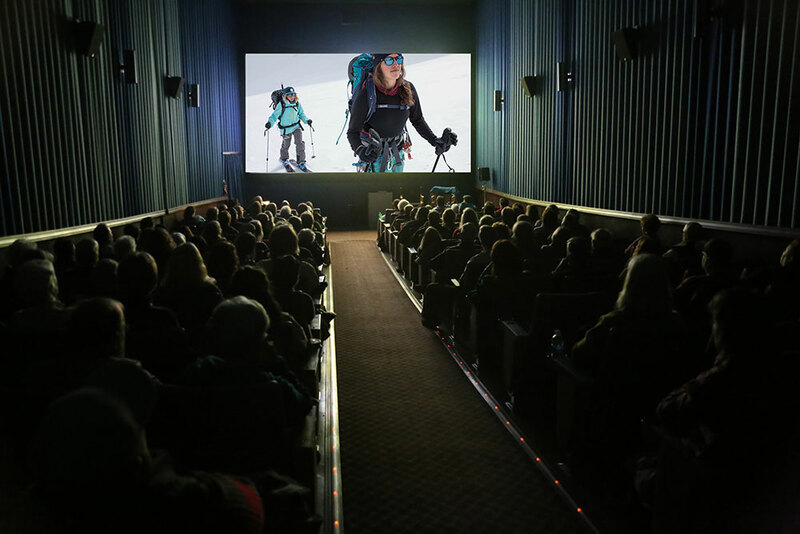 National Geographic magazine featured Philipsburg in a 2013 write-up of the Best Secret Ski Towns of North America that “deliver some of the most unspoiled skiing North America has to offer.” Downhill Detail: 2,200 acres + 67 runs + 2,388 ft. vertical drop. Straddling the Montana/Idaho border west of Missoula, Lookout Pass sees the heaviest snowfall in Western Montana at 400 inches per year. 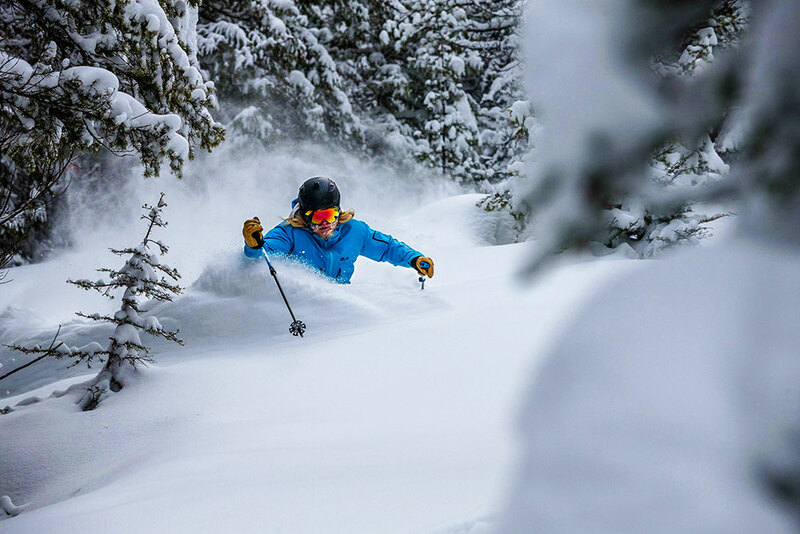 The season starts early at this family-friendly resort offering bargain prices for big snow and an adventurous mix of easy, intermediate and expert runs as well as a full-service lodge with food, drinks, rentals and lessons. Lookout Pass also offers two terrain parks with huge banks, mounds, launches, rails and an 1,111-foot quarter pipe. Downhill Detail: 540 acres + 35 runs + 1,150 ft. vertical drop (with a planned expansion to 1,023 acres and 1,650 ft. vertical drop). Feeling on top of the world on a bluebird day at Lost Trail Powder Mountain. Also straddling the Montana/Idaho border on top of the Continental Divide, Lost Trail Powder Mountain is well-known for its reliable snowfall and consistently good snow conditions. 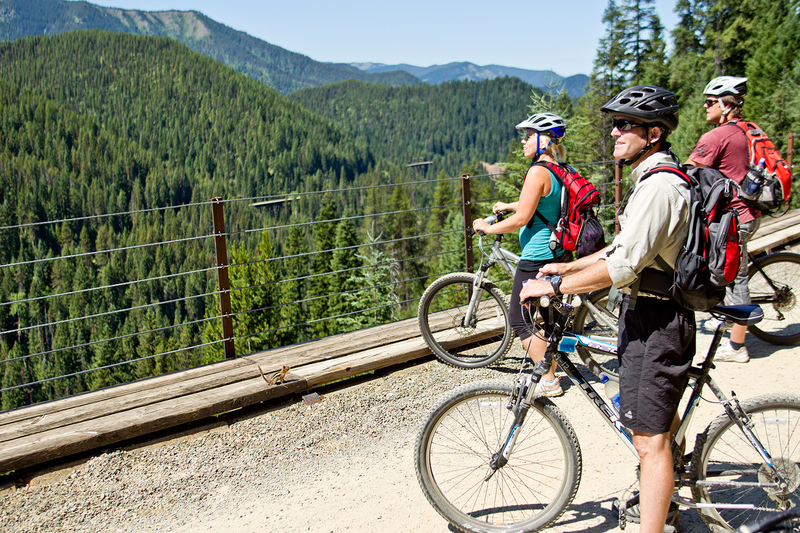 From the slopes, take in breathtaking views of the Bitterroot Range of the Northern Rockies. Lost Trail is family-owned and operated and offers plenty of room for all types of skiers and boarders, whether you’re a beginner or expert. Downhill Detail: 1,800 acres + 69 runs + 1,800 ft. vertical drop. One of Montana’s newer ski hills, Blacktail Mountain caters mostly to beginner and intermediate skiers, making it the ideal downhill destination for a memorable family ski vacation. At this unique ski area you actually start out at the top of the mountain and take the chairlift back up. The well-groomed intermediate runs here are perfect for long, carved turns with a few steep sections to mix things up. 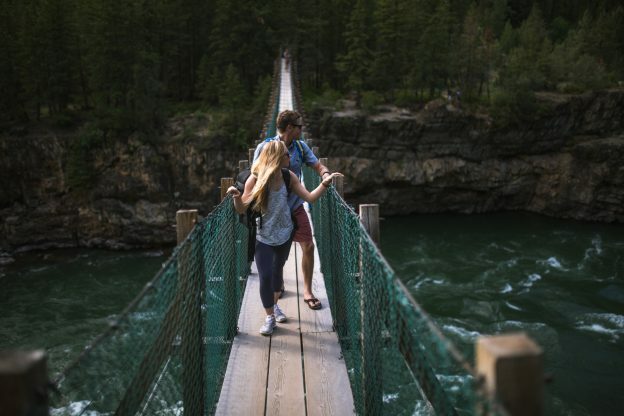 Just 17 miles from the charming town of Lakeside on Flathead Lake, take in jaw-dropping views of the lake, Glacier National Park and the Mission Mountains. Downhill Detail: 1,000 acres + 24 runs + 1,440 ft. vertical drop. Call yourself King of the Hill on the wide-open slopes at Turner Mountain. Excellent snow conditions and beautiful scenery make for a successful day on the slopes at one of Montana’s most under-the-radar ski areas, once described as having some of the “best lift-assisted powder skiing in the U.S.” by SKI magazine. Just north of Libby, Turner boasts an impressive vertical drop—2,100 feet—and 60 percent of its terrain is rated black diamond, though there’s plenty of beginner and intermediate terrain to be explored. Fun fact: The entire ski area is available for private rental. Downhill Detail: 400 acres + 22 runs + 2,110 ft. vertical drop. 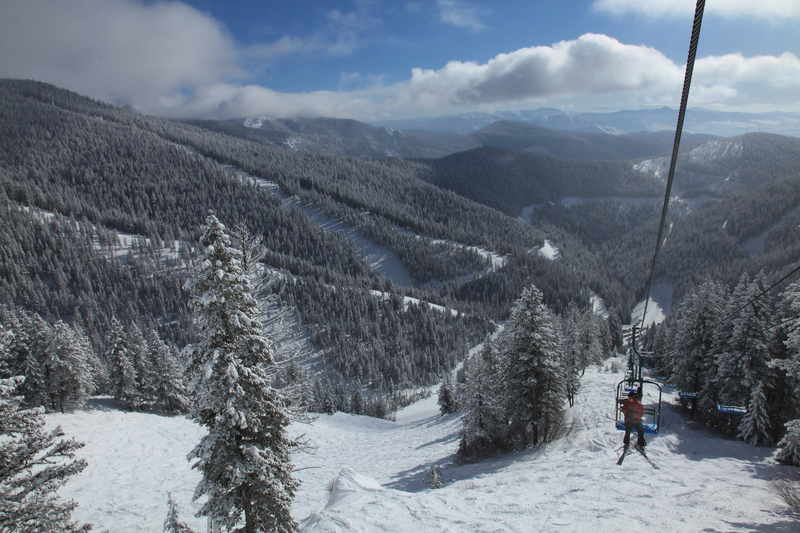 You’ll also find epic downhill and ski-town charm at Montana Snowbowl, 12 miles from Missoula. This extremist’s dream known for deep powder bowls and expert runs is also a local’s favorite, with plenty of terrain for beginner and intermediate skiers. The lodge’s wood-fired pizza and famous bloody marys are irresistible, too. Downhill Detail: 950 acres + 37 runs + 2,600 ft. vertical drop. For downhill adventures at our most well-known ski area, make your way to Whitefish Mountain Resort in the quintessential winter mountain village of Whitefish. 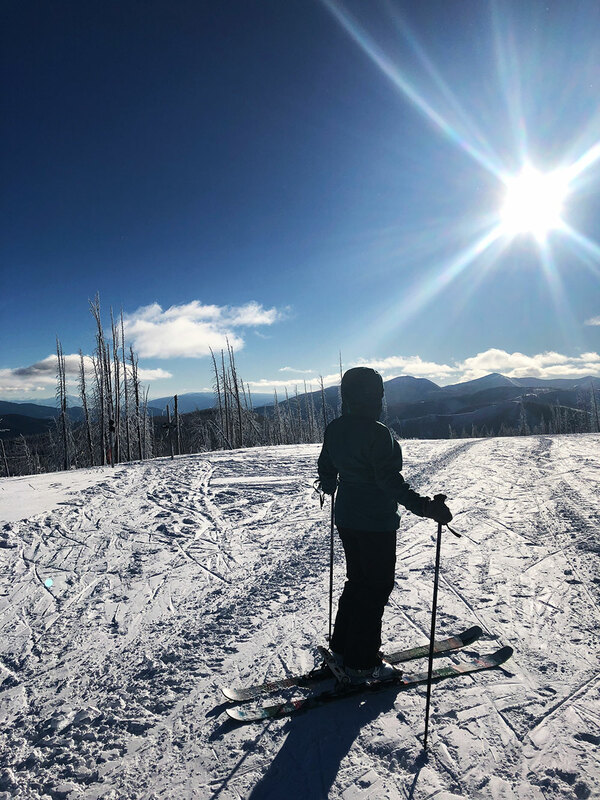 This entry was posted in Lakeside, Libby, Missoula, Montana, Montana Fun, Outdoor Fun, Philipsburg, Sula, Things To Do, Uncategorized, Whitefish, Winter Fun on January 21, 2019 by glaciermt. 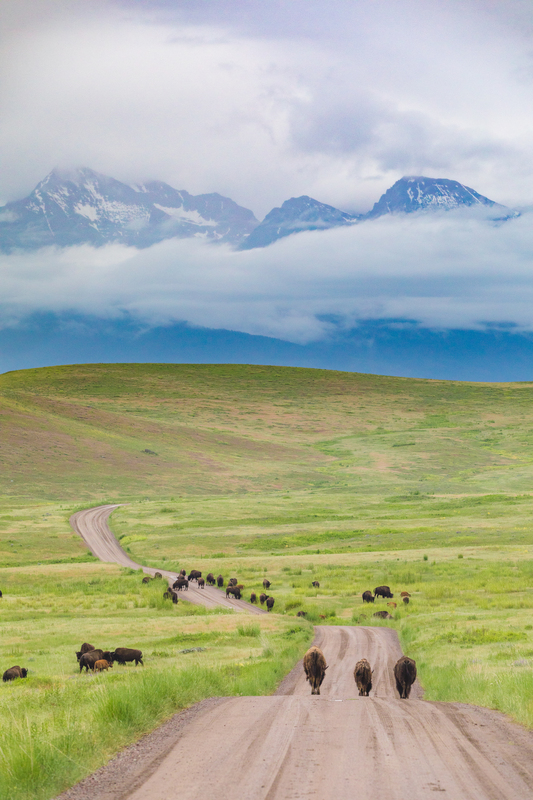 It’s no secret that Montana is a pretty big place with plenty of room to roam. We like to take advantage of all that gorgeous open space and cover as much ground as we can, especially in winter when we can power up our sleds and snowmobile miles and miles of bragworthy winter-wonderland terrain. 4,000 miles of scenic groomed trails crisscross Montana, and untouched backcountry powder playgrounds are too many to count. You’ll find world-class snowmobiling under our famously big blue skies, with some of the best riding in the state right here in Western Montana’s Glacier Country. Mesmerizing woodland landscapes are interwoven with premier mountain towns, where charm and hospitality are in abundance, and an obsession with snow is palpable. More than 300 inches of powder falls annually around these parts, and you’ve got easy access to trails and open space. Though snowmobiling within Glacier National Park is prohibited, the beauty and sheer wild wonder of the park can be viewed for miles beyond, and the charming small towns just outside the park are open year-round and always at the ready to host winter outdoor lovers with warm lodging and inviting amenities. 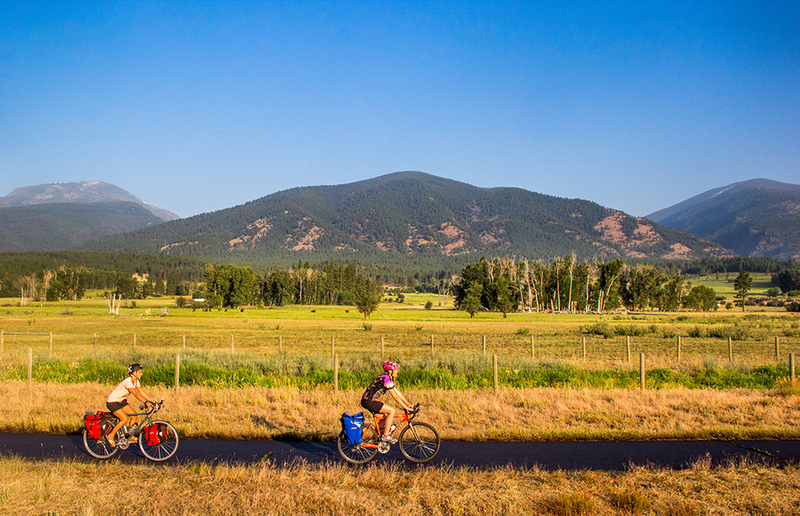 Test your mettle in Montana’s rugged and remote Marias Pass Trail Complex, or head beyond the park’s surrounding towns, where there’s much more riding to be had. Discover the recreation wonderland of Western Montana’s Flathead Valley, explore extensive family-friendly trails in the Haugan area, crush a ride in scenic Kootenai Country, slay the Skalkaho Pass in the beautiful Bitterroot Valley, or fan out from a Missoula basecamp and explore Lolo Pass or the Garnet Ghost Town trail system. There’s brand new terrain to be explored in Glacier Country, too. In the summer of 2017 two wildland fires burned areas in Seeley Lake, Ovando and Libby, making way for new riding terrain. Come Sled the Burn. Sledders wind their way through mountains tinted by alpenglow. 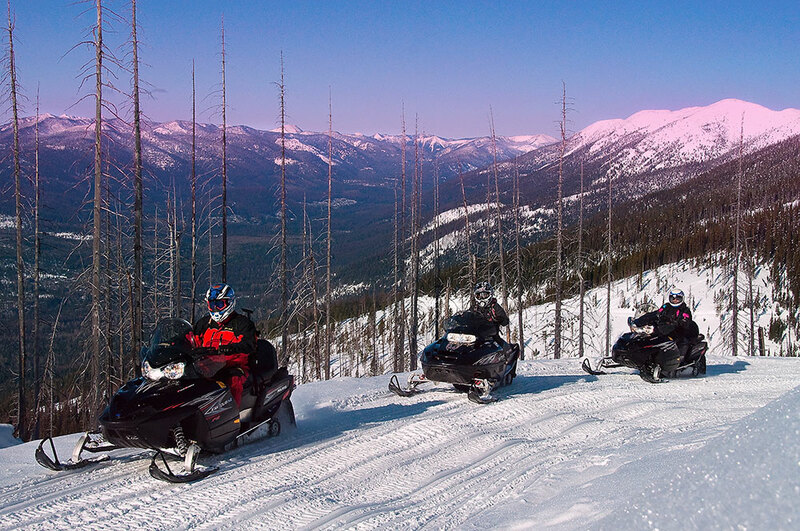 Snowmobiling in Western Montana’s Glacier Country is matched only by that of snowmobiling in Yellowstone Country Montana. The sledding opportunities in these regions are renowned, and the season here is quite long. For a park-to-park adventure, take a Glaciers to Geysers sled tour. Find itineraries, trails, resources and snowmobile club information all on our new and very helpful glacierstogeysers.com website. 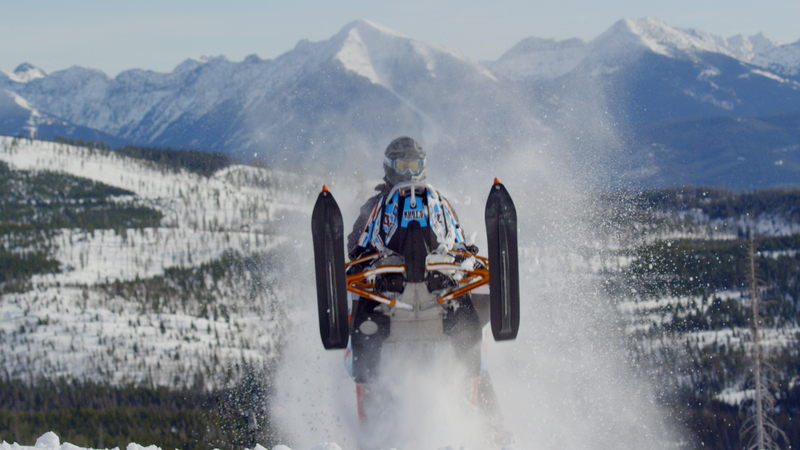 Part of the beauty of a “sledventure” in Glacier Country is the post-sled revelry. Did you know Montana ranks 4th in the nation for breweries per capita? Countless breweries and distilleries dot the region. When it’s time to power down, pull up a barstool for a finely crafted beer or a whiskey made from glacial waters and locally-sourced ingredients. You’ll find yourself in the midst of a community of fellow sled heads, all with a tale to tell of a killer day in unfathomably deep, fresh powder. Our downtown regions focus on authentic experiences, where food and drinks are a priority, lodging is exceptional, and there are plenty of places to fuel up on caffeine before a day of snow play. Beginners to expert sled heads will all find their place here, and there are plenty of guides and outfitters available to help you out. Plus, local snowmobile clubs are always at the ready to hook you up with trail details. For groomed trail information as well as information on passes and permits, visit Glacier Country Tourism and Glaciers to Geysers. As always, sled safe and check avalanche reports before you power up. 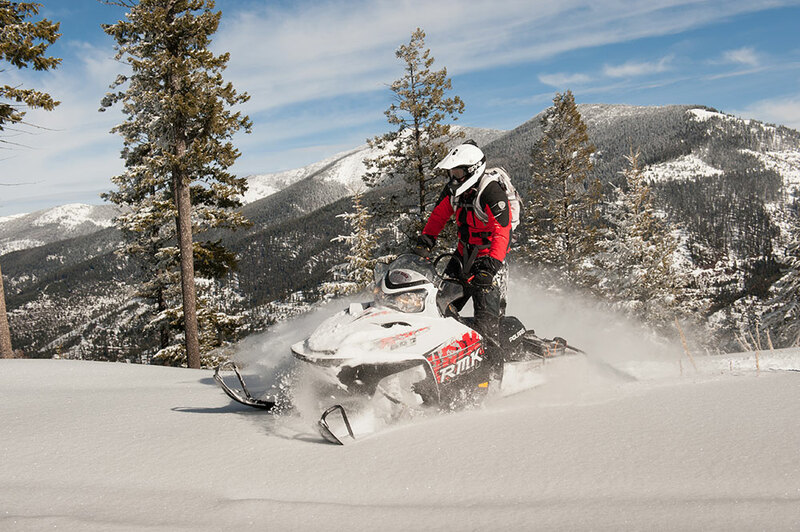 Order your free Montana Snowmobiling Guide and trail map. 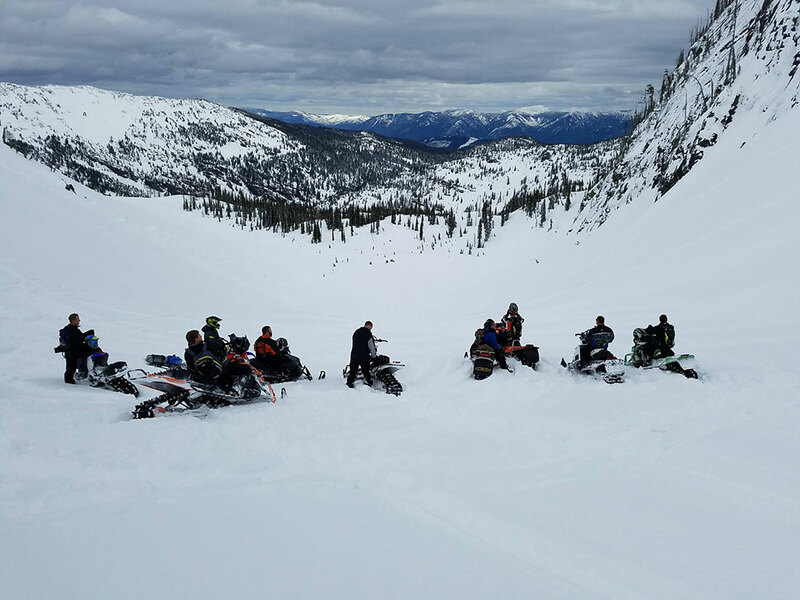 This entry was posted in Bitterroot Valley, Flathead Valley, Haugan, Libby, Lincoln County, Ovando, Seeley Lake, Uncategorized, Winter Fun on December 3, 2018 by glaciermt. 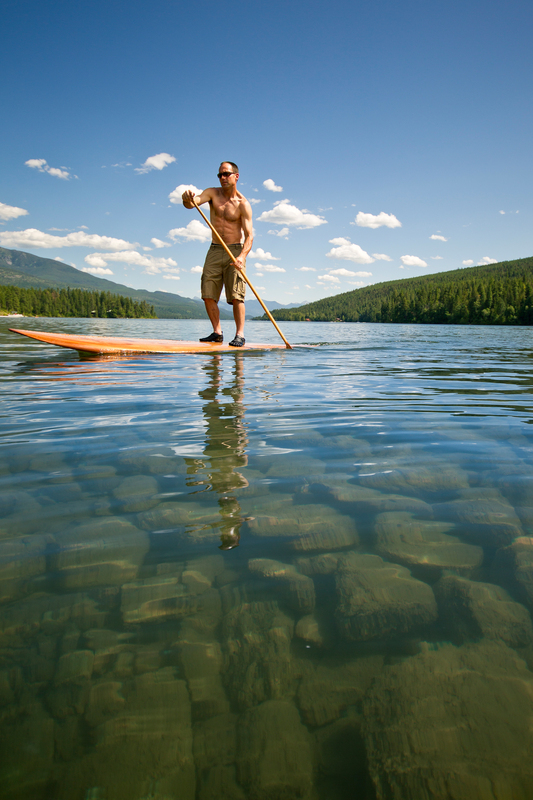 Come see what’s SUP in Western Montana. 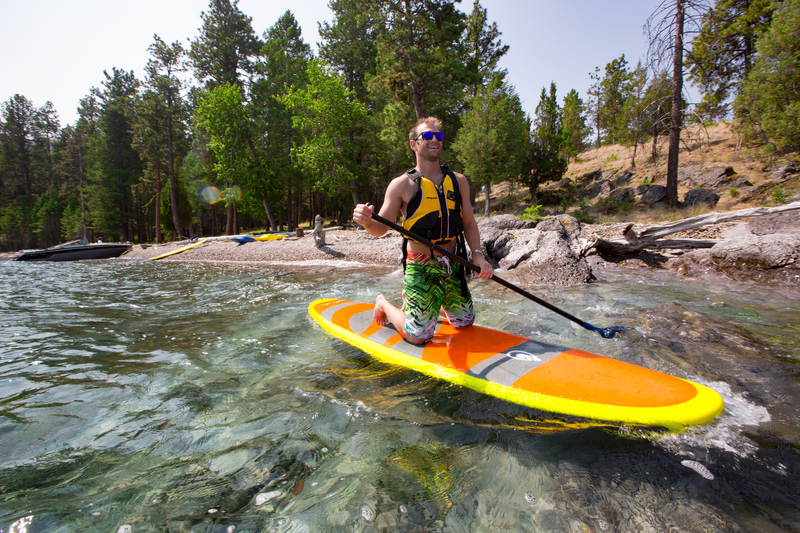 Stand-up paddleboarding, or SUP, is an increasingly popular way to explore Montana’s sparkling alpine lakes and scenic, lazy rivers. In fact, SUP is the fastest-growing water sport in the world. Surfing meets kayaking in this epically fun way to play on the water. If you’re new to the sport, your best bet is to go with a guide. Many local outfitters here in Glacier Country offer rentals, lessons and guided trips, so, you’re in luck. 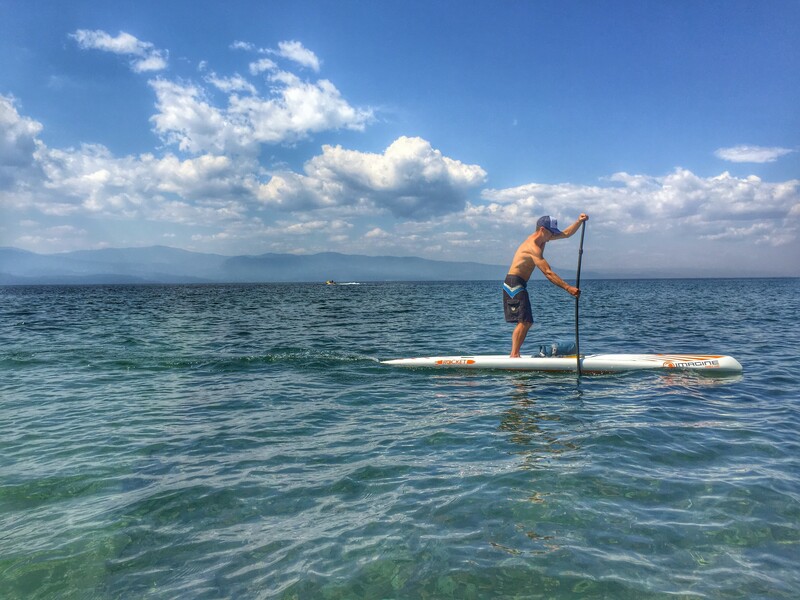 Here’s a list of our top 12 SUP spots as well as the folks who can help you get on the water for your Western Montana stand-up paddleboarding adventure. 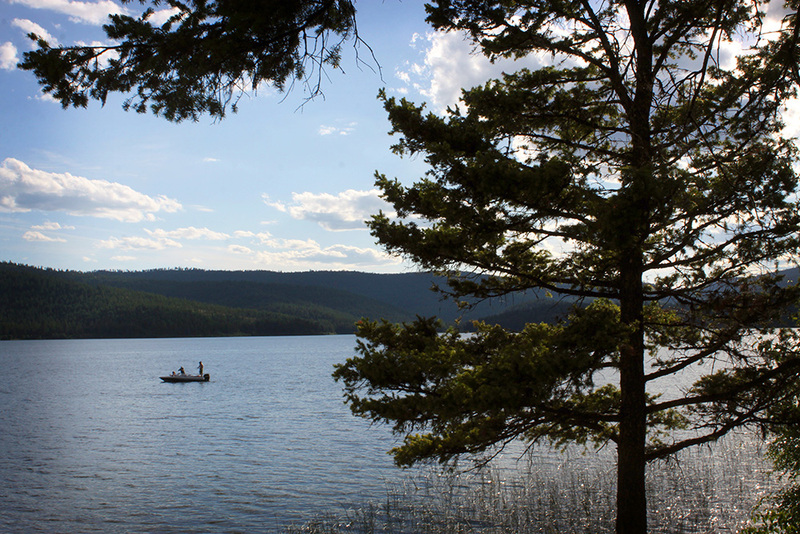 Fifteen miles west of Kalispell, Ashley Lake is a real charmer. Easy on the eyes, the alpine aqua waters of this special SUP spot make for an unforgettably picturesque day. 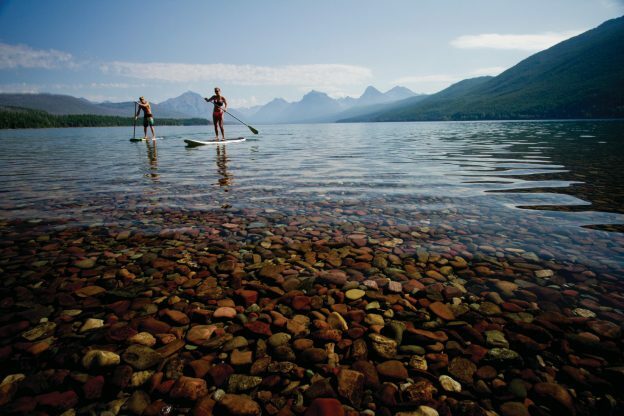 Paddle the largest freshwater lake west of the Mississippi. Wayfarers State Park has some of the best Flathead Lake access, including a beach area as well as rocky cliffs along the shoreline. The water is clean and clear and is typically sheltered from wind and waves, though it can make for some fun SUP action when the swell picks up and creates near surf-like conditions, which are also great for downwind paddling. Wayfarers happens to be one of the best spots on the lake to watch the sunset, too. The north shore of Flathead Lake offers miles of undeveloped shoreline. 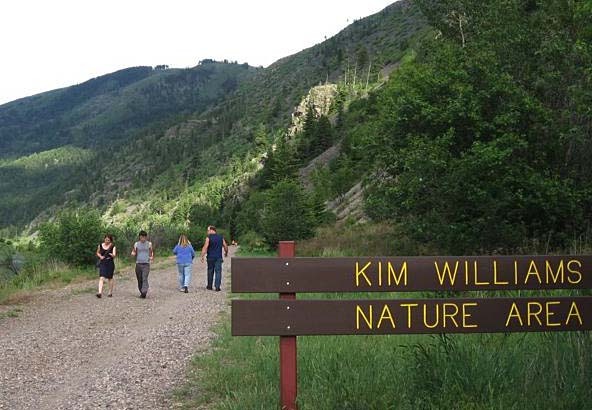 It’s a great place to spot waterfowl, eagles, osprey and deer, and take in amazing mountain views. 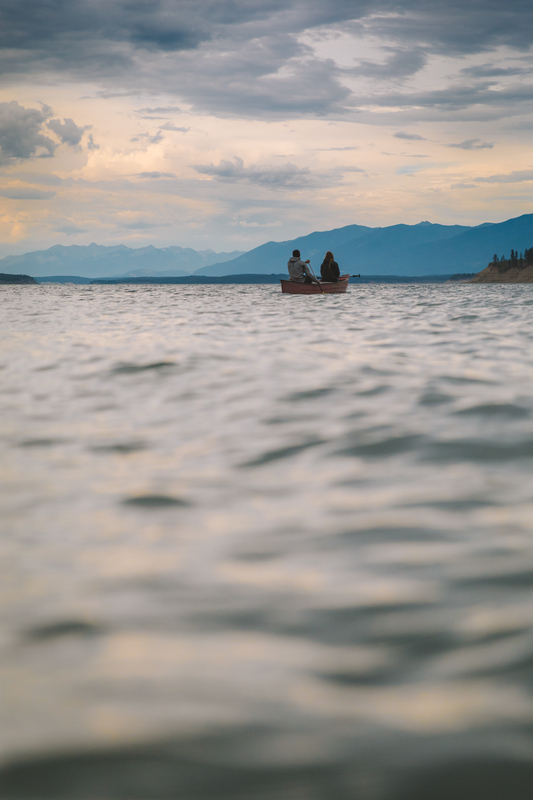 If you access the lake via Bigfork Bay, you’ll be able to paddle right into the storybook town of Bigfork for some post-SUP food and drinks or delicious Sweet Peaks Ice Cream. If you’re up for a celebration, plan your trip around the Northern Rockies Paddlefest at Wayfarers State Park, held annually in May. Anywhere you decide to put in on Flathead Lake, great views and cool waters will meet you there. 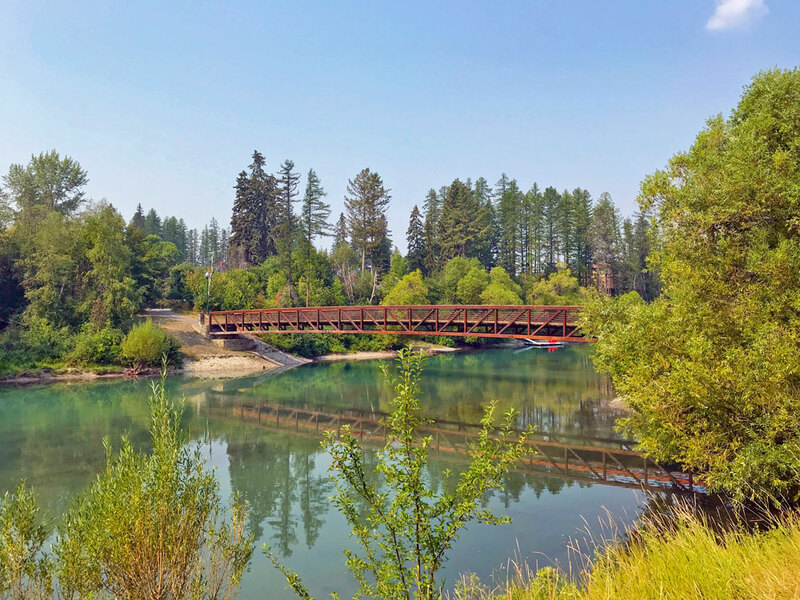 The Swan River flows into the Bigfork Bay, which allows the more adventurous to try paddling moving water. There are several access points, which allow for more of a downriver journey while the river winds through a picture-perfect landscape. There are miles of slow-moving water perfect for beginners. There is also a nice class 2+ rapid stretch, which is popular for inner tubing, but also ideal for paddlers looking for an introduction to whitewater paddleboarding. 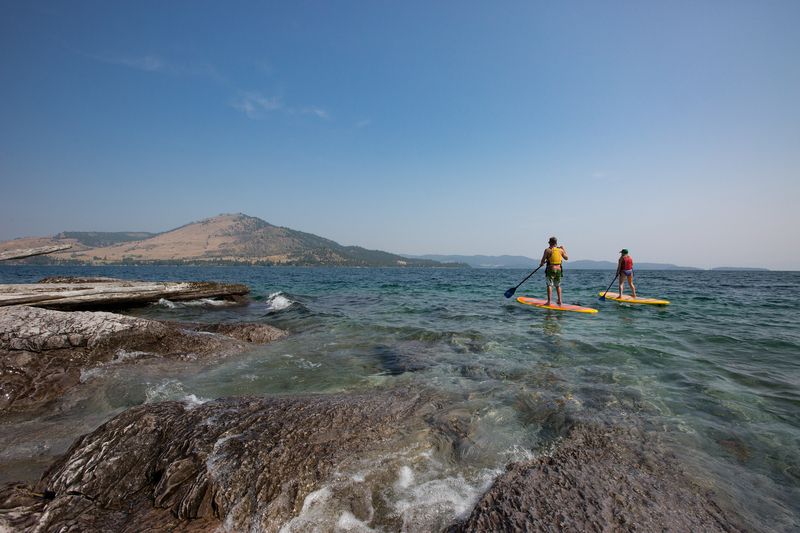 These three lakes offer authentic Montana SUP adventures. 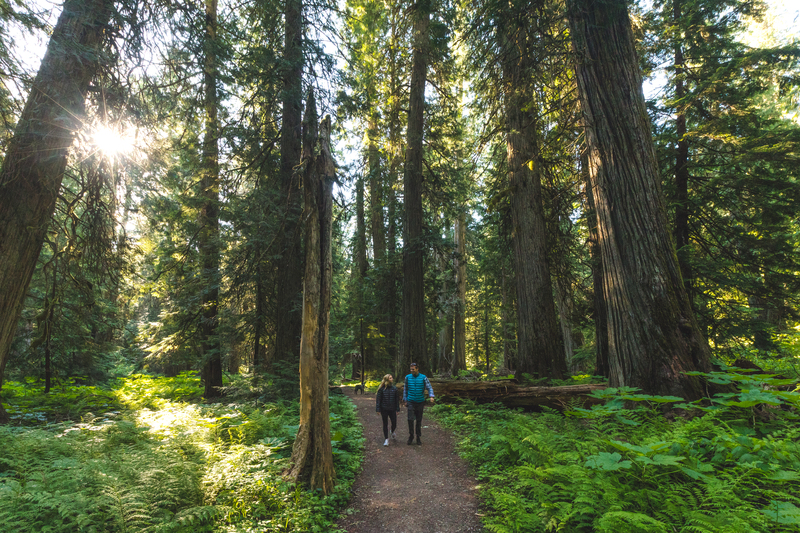 Paddle to the sandbar in the middle of scenic Swan Lake, experience the famously warm waters of Echo Lake, or combine your Holland Lake paddle with a 3.3-mile out-and-back hike to gorgeous Holland Falls. The Swan Valley lakes offer amazing paddling in pristine waters. Here a paddleboarder cruises Swan Lake. TRIP TIP: For Swan River plus Ashley, Flathead and Swan lakes SUP gear, rent a board at Base Camp Bigfork and get complimentary delivery and pickup as well as on-the-water instruction. Base Camp also rents boards to those who want to self-drive their gear to any number of lakes in Glacier National Park. 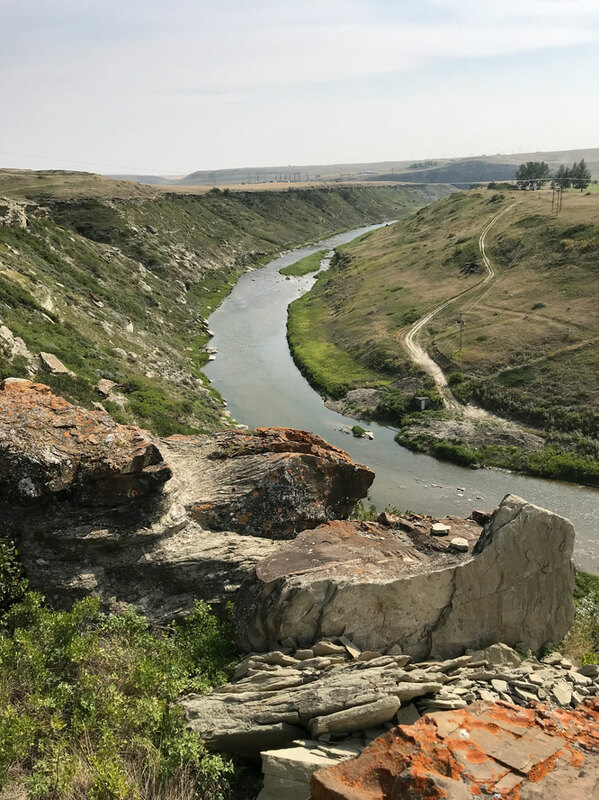 The clear, cold, trout-filled waters of the Blackfoot—made famous by Norman Maclean’s “A River Runs Through It”—offer the scenic splendor of canyon walls often dotted with majestic bighorn sheep. 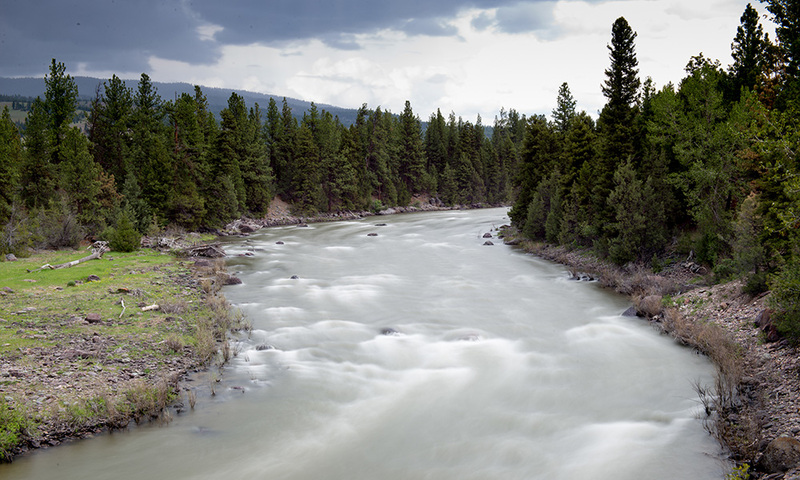 Paddle the Blackfoot in July for unobstructed flows. Experience the eclectic town of Missoula from the waters of the winding Clark Fork River. 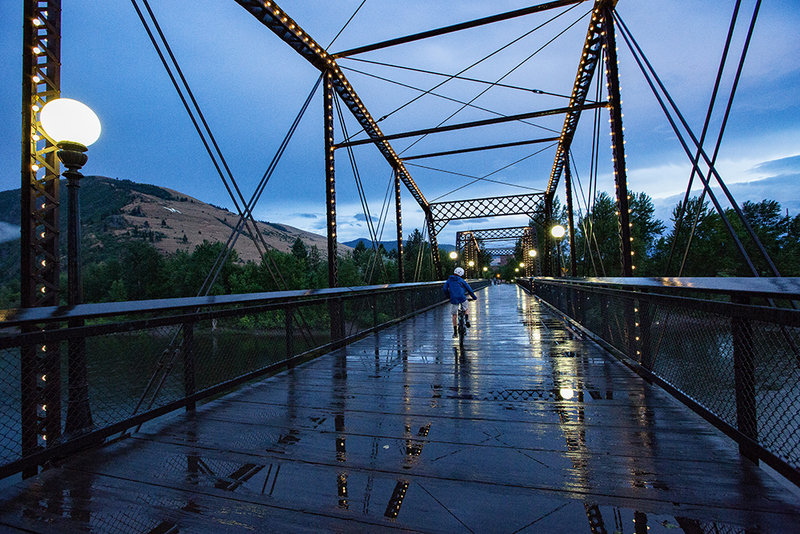 Put in at the Sha-Ron fishing access site in East Missoula and then hop off the water at the river’s edge in downtown Missoula, where you’ll find good eats, plenty to drink, and lots to see and do. This scenic valley waterway is flanked by the beautiful rolling Sapphire Range to one side and the dramatic Bitterroot Mountains to the other. 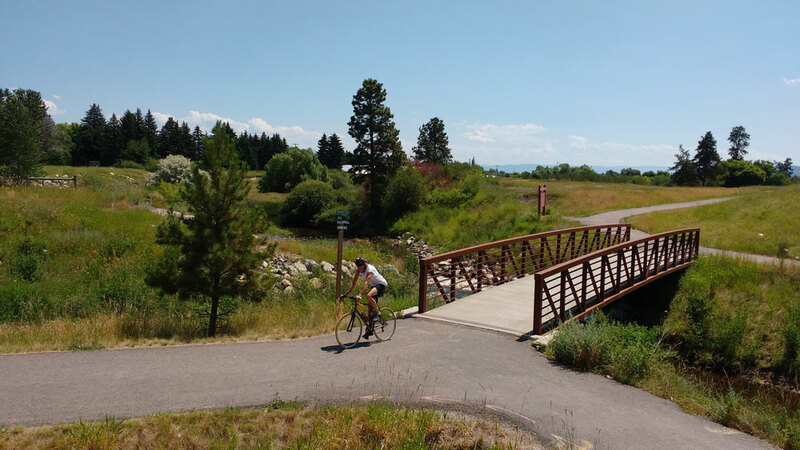 Hop on the water at Bells Crossing and paddle to the Stevensville Crossing site to hop out. Solitude abounds at this Bitterroot Valley gem 8 miles south of Hamilton in the Bitterroot National Forest. There’s a sandy beach at the north end of the lake, perfect for paddling and swimming. 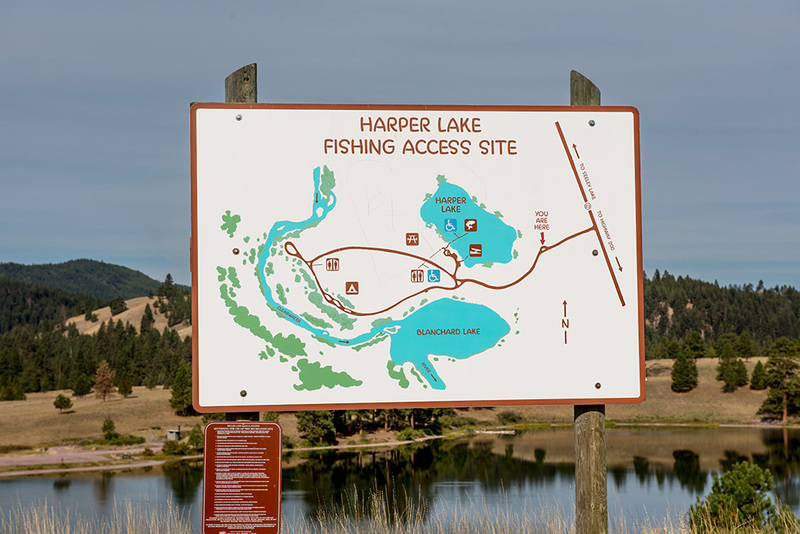 Bring a picnic lunch and your hiking shoes…abundant trails surround the lake. 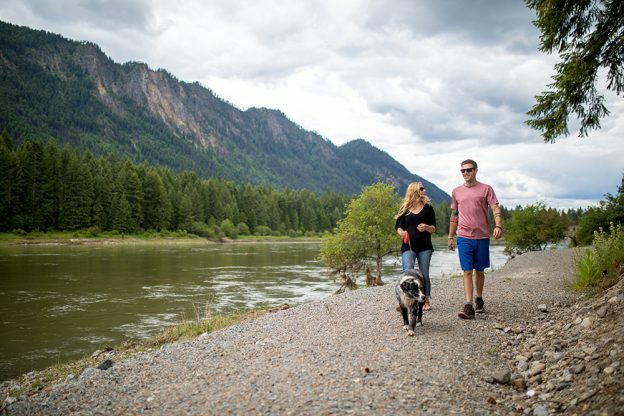 TRIP TIP: For Blackfoot, Clark Fork, Bitterroot and Como SUP rentals, guides, gear and tips, check out Missoula’s Trail Head, or Bob Ward’s, with locations in both Missoula and Hamilton. This Stillwater State Forest stunner north of Whitefish, dazzles and is the perfect tucked-away spot for a quiet day on the lake. Feeling adventurous? 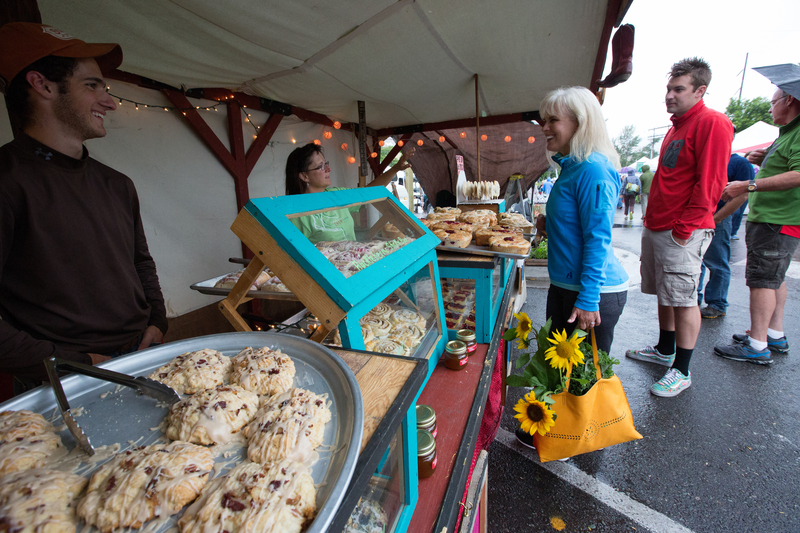 Head south to Whitefish (1.5 hours) for post-paddle food, drinks and fun. West of Whitefish, the warm waters of Tally Lake offer a peaceful paddle among the lush trees and scenic cliff walls of the Kootenai National Forest. Head to the east shore for a serene evening paddle. 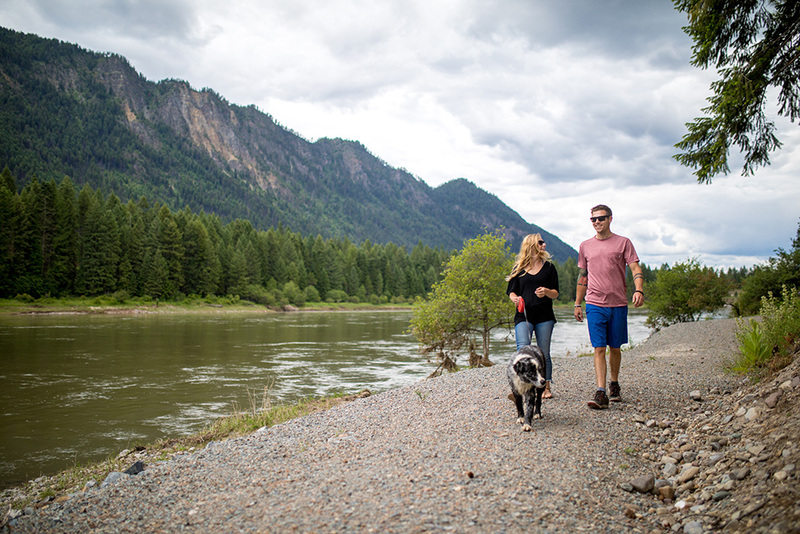 The stunning emerald waters of the Flathead River offer a Glacier Country experience like no other. Paddle the Middle Fork from West Glacier to Blankenship Bridge, passing through a jaw-dropping gorge with a perfect cliff-jumping spot. The North Fork is one of only four Wild and Scenic Rivers in Montana and forms the western border of Glacier National Park. Breathtaking scenery is a given, and black bear sightings are not unheard of. For Tally Lake and Flathead River SUP rentals, plus the goods on gear and guides, visit the friendly folks at Tamarack Ski & Lake Shop. 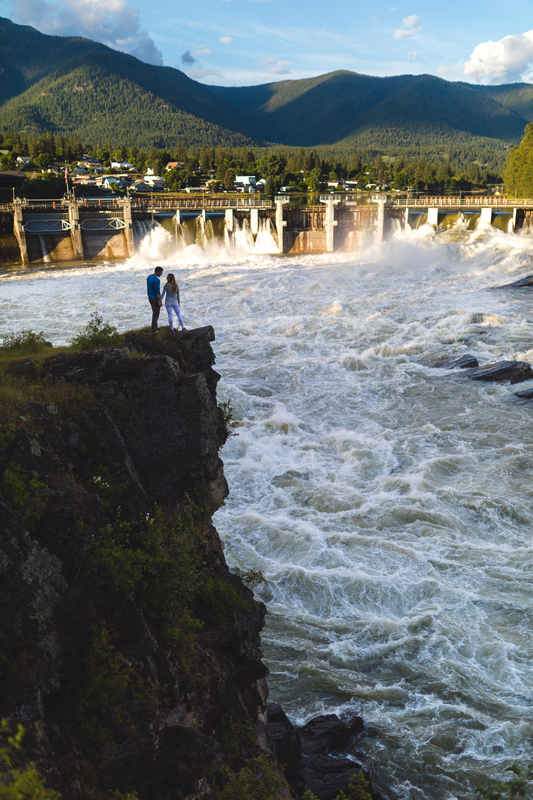 This trout-heavy reservoir between the Purcell and Salish mountains in Libby, Montana offers scenic-byway landscapes, a sandy beach, wildlife watching and the opportunity to take a pre- or post-paddle Libby Dam tour. TRIP TIP: For Lake Koocanusa access and gear rentals, head to the Wilderness Club, just a short walk to the Lake Koocanusa beach area. Before you hit the water for your Western Montana SUP adventure, contact one of the outfitters listed above for details on where to float when, based on water flows and temps, and always check the weather before you head out (especially when lake paddling away from shore). Spring runoff means fast-moving rivers. 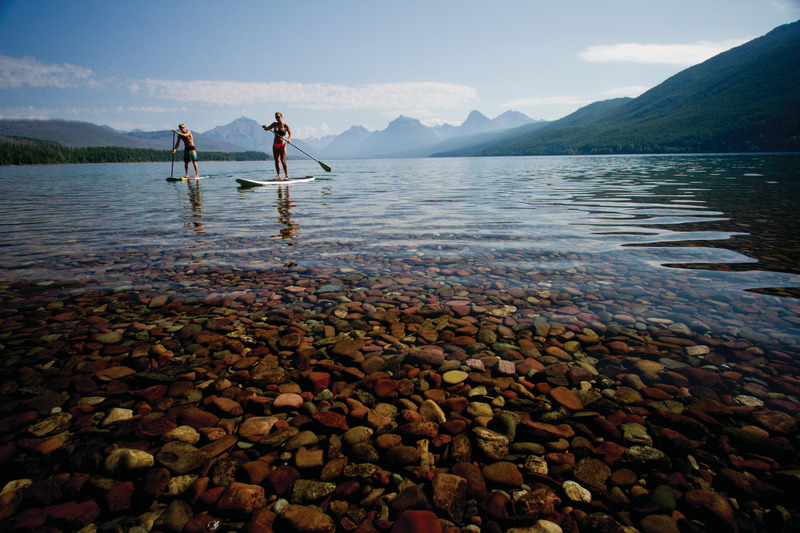 (If you’re new to SUP, stick to a late-summer guided river trip or take a calm lake tour.) Learn basic techniques and safety tips from these local outfitters, too. Our lakes and rivers offer amazing experiences, but proper preparation and equipment are always recommended. On the river, wear a quick-release leash around your waist. It’s IMPERATIVE that you use quick-release technology in SUP, as ankle leashes can get hung up on rocks and other debris. Wear a PFD, a helmet, a wetsuit and protective gear, especially in shallow rivers. On the lake, bring a flotation device, try to confine your trip to an hour or less, and stay closer to the shore. SUP is a full-body workout. Plan your trip with that in mind. 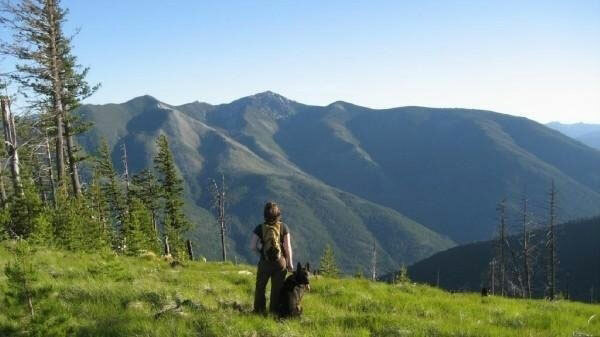 Learn more about safety, rules and regulations through Montana Fish, Wildlife & Parks. Lastly, have fun paddling paradise. That’s what’s SUP in Western Montana’s Glacier Country. 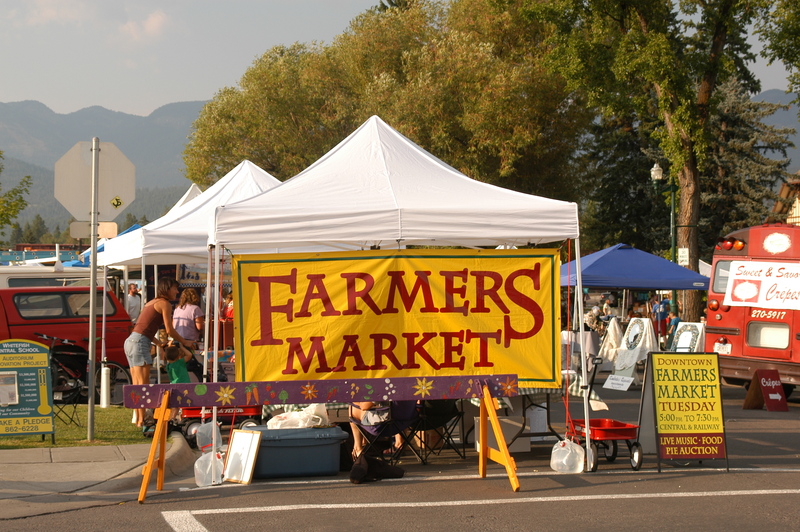 This entry was posted in About, Bigfork, Bitterroot Valley, Events, Family Fun, Flathead Valley, Getting Around, Hamilton, Kalispell, Libby, Missoula, Montana, Montana Fun, Outdoor Fun, Parks, Seeley-Swan Valley, Summer, Swan Lake, Things To Do, Uncategorized, vacation, Water Fun, Whitefish on July 30, 2018 by glaciermt. From downtown theaters, bars, breweries and main streets to hot springs and a river’s edge amphitheater, there’s no shortage of places to see good music in Western Montana. 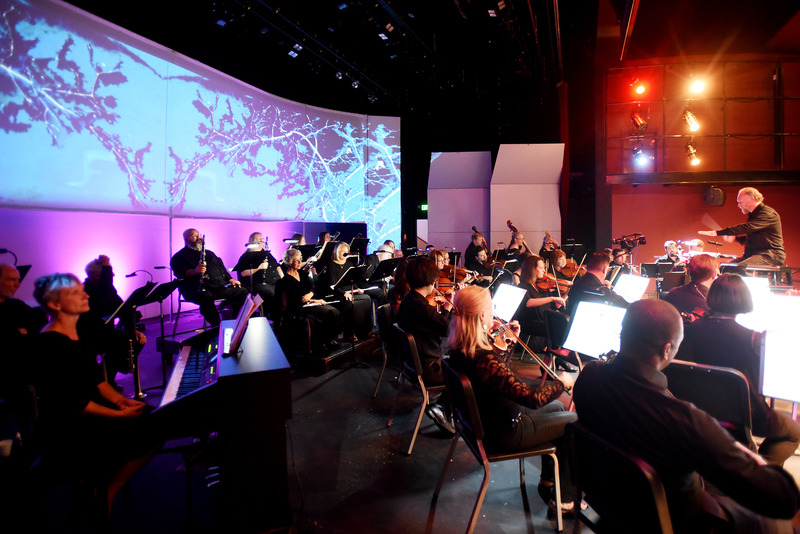 Our noteworthy music scene boasts venues big and small, hosting national acts, local singers and songwriters, symphonies and other mountain sounds made all the more magical by the stunning Montana landscape. 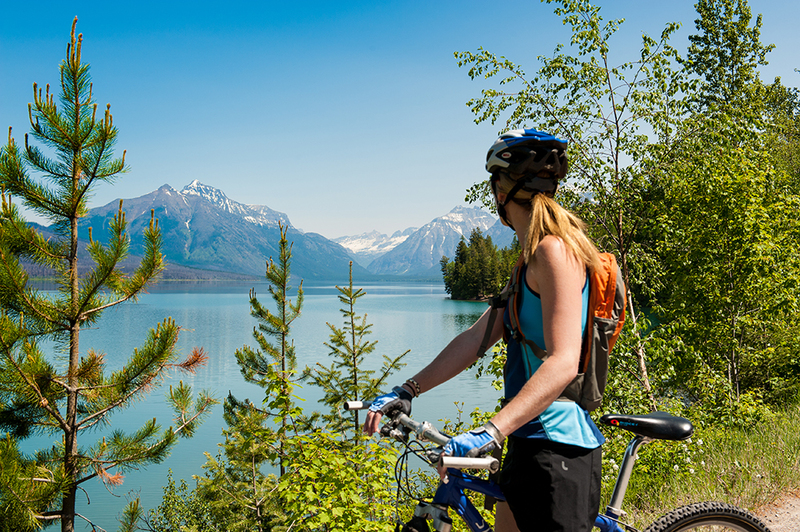 From blues to bluegrass, there is so much to hear and see in Glacier Country. 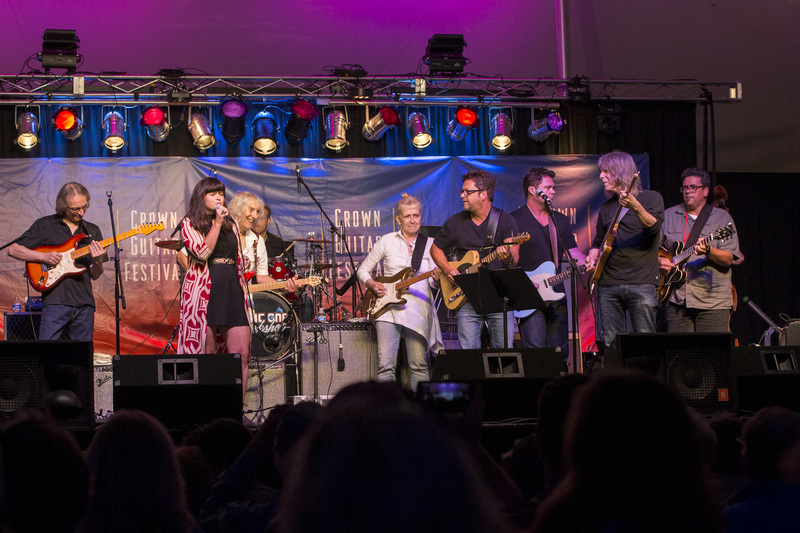 Photo: Crown of the Continent Guitar Festival. 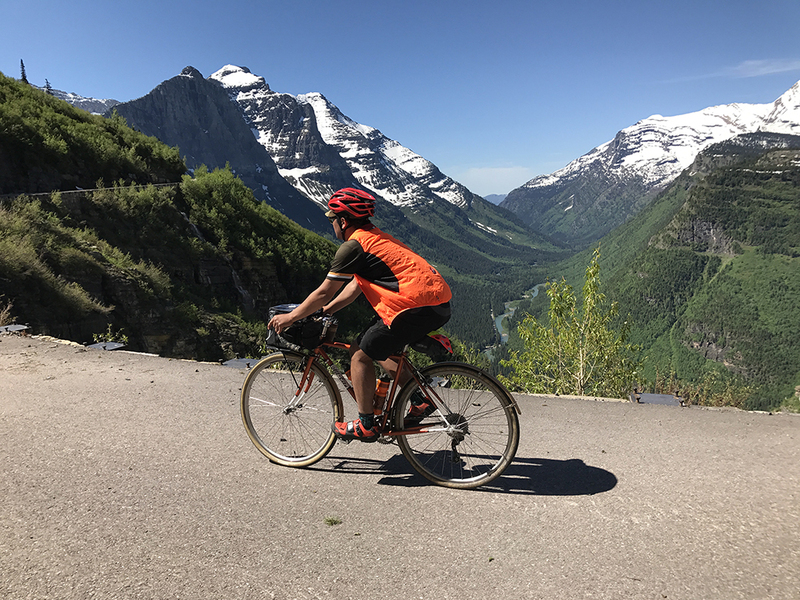 Tune in below to read about Glacier Country’s top spots for concerts, music festivals and intimate local shows. As the musical hub in Western Montana’s Glacier Country, Missoula is offering up some amazing spaces to enjoy live music. 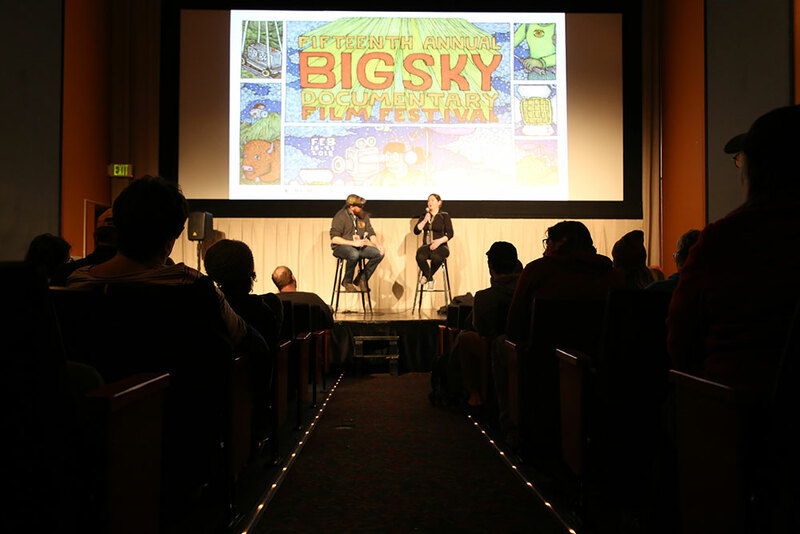 Offering a world-class entertainment experience with a community-centric vibe, Missoula’s venues are serving up a serious dose of Montana melodies. One of Glacier Country’s newest venues, the KettleHouse Amphitheater capitalizes on its natural setting for an authentic Western Montana outdoor concert experience, i.e., a downright good time. Nestled on the banks of the famed Blackfoot River and adjacent to the KettleHouse Brewery, the new amphitheater brings your favorite artists to a truly unique and inspiring spot. 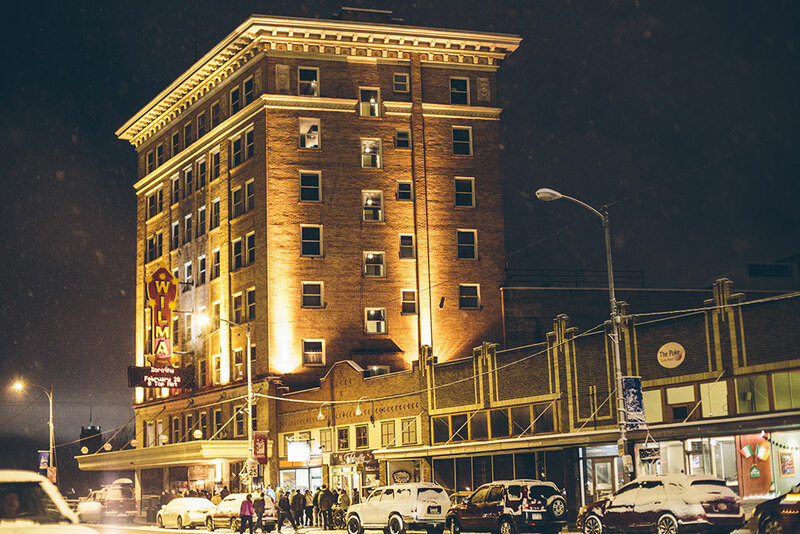 Next you can check out a Missoula icon: The Wilma. 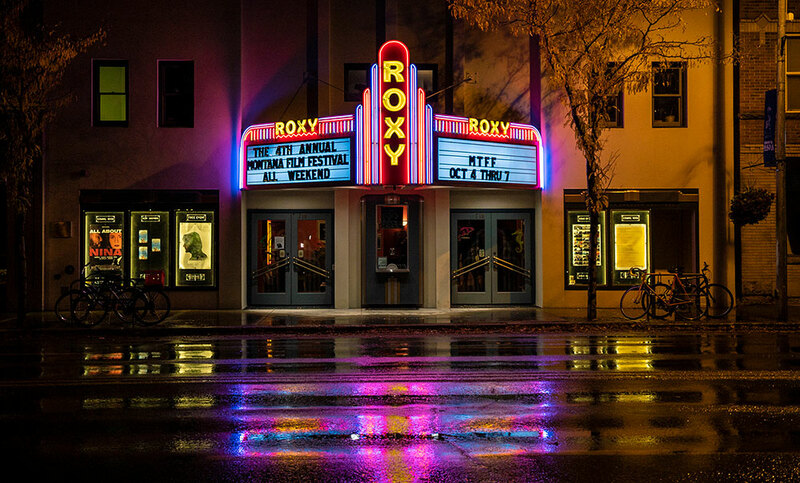 This beautiful venue, located in downtown Missoula on the edge of the Clark Fork River, offers concertgoers the character and charm of a historic theater with state-of-the-art amenities like one of the country’s best sound systems. Check out what’s happening at The Wilma here. Get up close with your favorite national and local musicians in the intimate club experience that The Top Hat provides, and eat like a rock star, too. The Top Hat serves up good tunes and great food. See what’s up next on the music menu here. 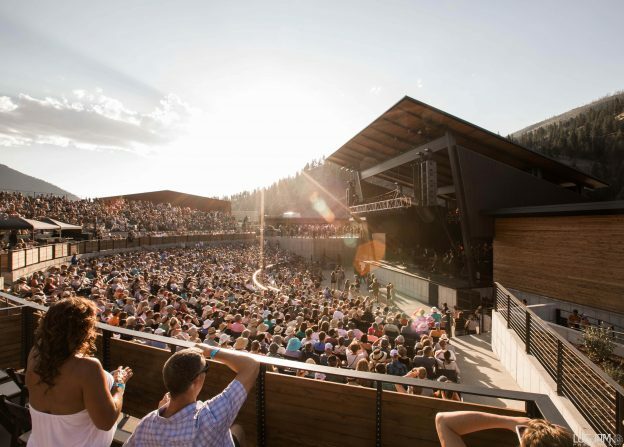 Last but not least, Big Sky Brewing Company Amphitheater offers an incredible summer concert series every year and you’ll love the brews and tunes at this location. When it comes to mixing local beer with live music, we don’t miss a beat. To know Western Montana is to know that we lovingly craft (and savor) award-winning microbrews in more than 20 breweries across the region, and we like to pair our tall ones with live tunes. Just outside Glacier National Park, Kalispell Brewing hosts weekly music events and their rooftop patio provides a breathtaking view of the Swan Mountains. Dubbed Libby’s Living Room, dig the neighborhood vibe at Cabinet Mountain Brewing Co. 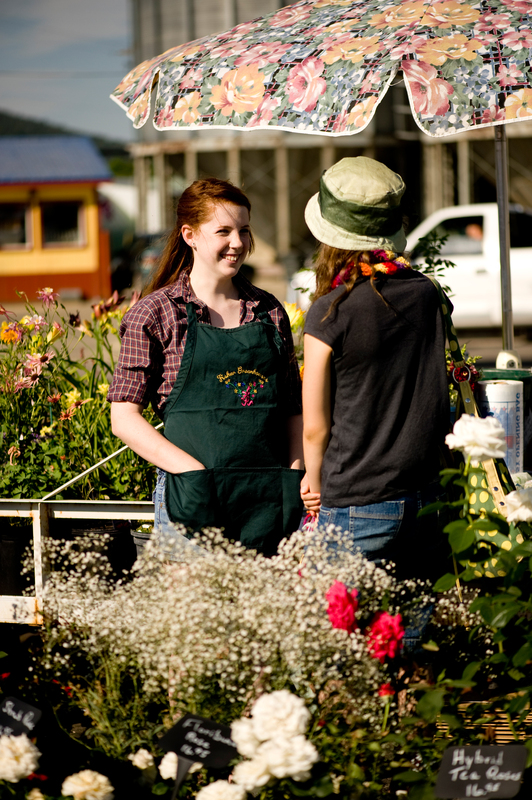 This Kootenai River Valley community gathering place hosts live music every week. Check out our full list of breweries and see what’s on tap. How about a little rhythm and relaxation? One of the things that makes Montana so heavenly is our hot springs. Visit one of our resorts for a soak in the soothing mineral waters and plan your trip around a live-music event. Bask in Bitterroot beauty at Lolo Hot Springs (Lolo), offering live music in the bar every summer Saturday night (Memorial Day – Labor Day). 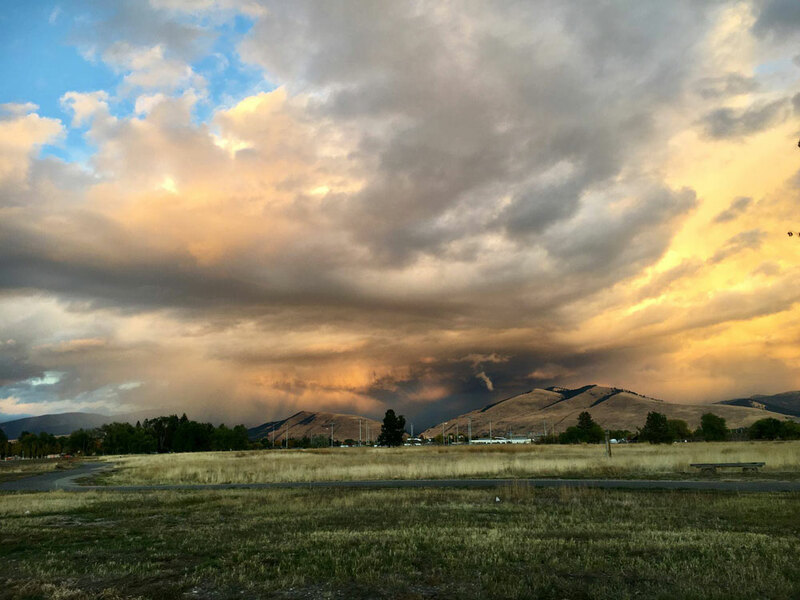 In the aptly named town of Paradise, relax and restore at Quinn’s Hot Springs Resort and enjoy concerts and music events from classical to cowboy at Quinn’s Paradise Hall. The Historic Symes Hot Springs Hotel and Mineral Baths hosts an annual Blues Festival plus live music every Friday and Saturday night. Soak up the sounds of mountain music right here in Glacier Country. There’s no denying we love our festivals in Western Montana, and a good ol’ fashioned music fest is just our scene. 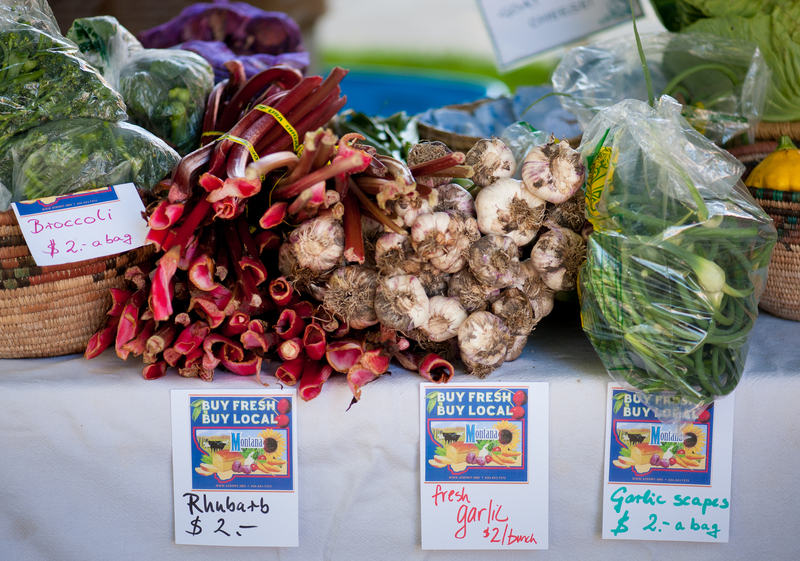 Plan your trip around one of these much-anticipated annual events. This entry was posted in Arts and Culture, Bigfork, Bitterroot Valley, Bonner, Events, Family Fun, Flathead Valley, Hamilton, Hot Springs, Kalispell, Libby, Lolo, Missoula, Montana, Montana Fun, Outdoor Fun, Paradise, Seeley Lake, Sula, Summer, Things To Do, Uncategorized, vacation, Whitefish on May 22, 2018 by glaciermt.